Many of these oxidizing chemicals can corrode metal, especially at higher temperatures. When metals corrode because of these substances, they produce a flammable hydrogen gas. Steel chemical tanks pose a risk of oxidation, but that risk is eliminated with crosslinked polyethylene tanks. 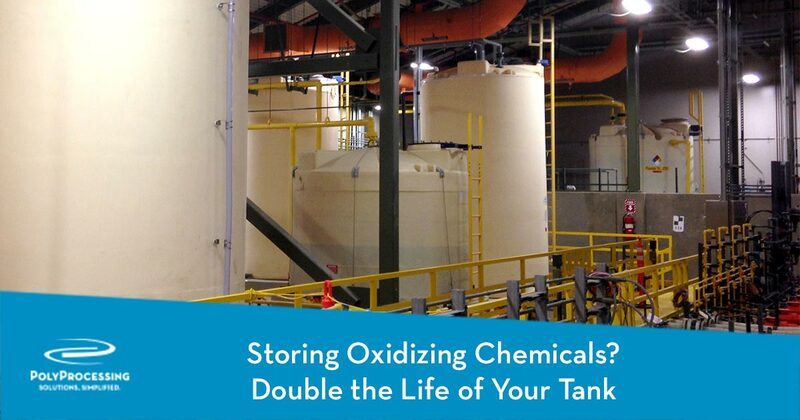 When storing oxidizing chemicals like sodium hypochlorite, antioxidants provide reliable protection for the interior tank wall. Most polyethylene resin already contains some form of antioxidants. Manufacturers try to protect the plastic, but the antioxidants are exhausted during the manufacturing process. They’re no longer active for any protection. Poly Processing’s OR-1000 System adds an antioxidant barrier between the oxidizing chemical and the XLPE. OR-1000’s inner surface is made of medium-density polyethylene, specifically formulated to resist oxidation. Its outer surface is made of XLPE, high-density crosslinked polyethylene, for superior strength. The two surfaces are molecularly bound together during the roto-molding process, creating a truly seamless bond between the XLPE and the inner surface of the polyethylene tank. OR-1000 is added at the end of the cooking cycle. After most of the structurally superior cross-linked resin has cured and the tank is close to complete, the OR-1000 system is added in what is referred to as the “double-shot”. The mold is stopped just long enough to introduce the OR-1000 resin into the XLPE, resulting in a seamless bond. The additional resin is cured along with the partially cured inner surface of the XLPE. This process only takes a few minutes as the tank finishes so the antioxidants are “uncooked away,” intact and fully charged. The OR-1000 system is not your typical resin. In fact, it has four times the antioxidizing power, compared to other commercially-available resins. This high level of antioxidant additive ensures longevity for your tank. Recently, with the help of a third-party leader in Polymer Engineering, we developed a new and improved OR-1000 resin. We've taken what we’ve learned in the field in the last 15 years and improved the material. Improvements in the long-term properties: The enhanced resin will last longer and allow your tank to last longer, too. Improved elongation: the new OR-1000 will maintain its elongation properties over time while storing heavy oxidizing chemicals. This performance is superior to the previous OR-1000 and other HDPE materials commonly used in tank construction. With OR-1000, you can store corrosive chemicals in an XLPE tank without compromising the longevity of the tank. The technology behind OR-1000 takes the guesswork out of choosing the right storage tank system for corrosive chemicals. 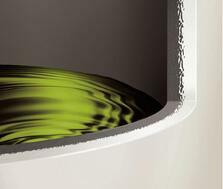 This antioxidant resin, combined with XLPE, creates a stronger, more durable tank without the risks and maintenance costs of an FRP tank or a mass-produced high density polyethylene tank. The combination of polyethylenes creates an ideal tank system for the most corrosive chemicals. The value, longevity, strength and durability of the OR-1000 system can handle almost any chemical and stand the test of time. For more information on using XLPE and OR-1000 to store corrosive chemicals, download the OR-1000™ Guide.